Germany's 22-year-old attacking mid-fielder Mario Goetze, who scored a goal that set his team on the path of glory, celebrated with his super model girlfriend Ann Kathrin Brommel on the sidelines at Maracana. Mario Goetze embraces his super model girlfriend Ann Kathrin Brommel after his extra-time goal set Germany on the path of World Cup glory. Gotze's girlfriend turned out to be his biggest cheerleader as she joined him in the post-World Cup celebrations on the pitch and was seen clicking pictures of the baby-faced attacking midfielder. 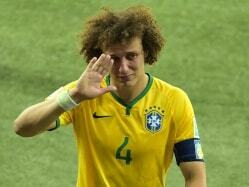 Most of the German players had their families out on the pitch to celebrate their biggest triumph. 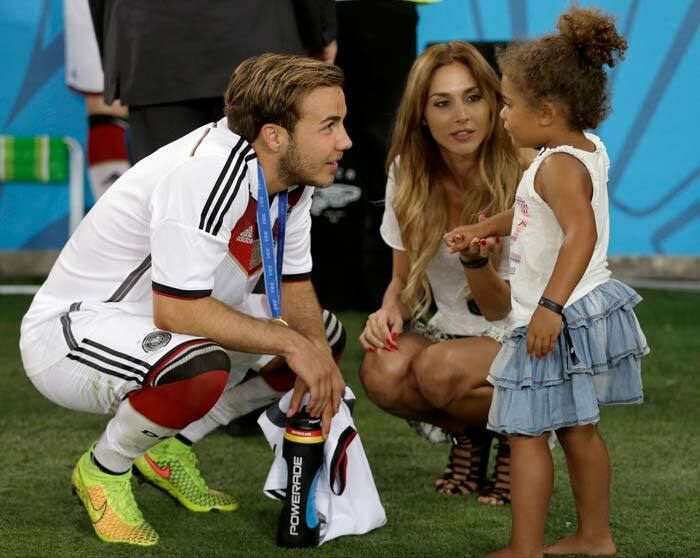 Here, Goetze and his girlfriend are seen conversing with teammate Jerome Boateng's daughter. After his extra-time heroics in the World Cup final, Mario Goetze will surely have a lot of stories to share. Here he is in conversation with his girlfriend, who seemed an equally excited listener, on the sidelines of their World Cup triumph. A woman behind every successful man? Definitely for Goetze, who thanked his family and his girlfriend after helping his side to a famous World Cup win in Brazil's famous Maracana.